In a few regions, the trail follows a path associated with events of such grand scope and scale that they determined the fate of the United States. The American Civil War is one such event. It was a decisive and formative conflict for the United States, and one that surprised contemporaries with its duration and its savagery. As the conflict loomed, both sides anticipated a quick and decisive test of arms followed by a happy return to homes, families, and farms. Instead, the conflict ground on for four years, ranging far and wide across the sprawling landscape of the still-young Republic, leaving towns and cities in ruins and tearing apart families and communities. It was a conflict that freed the slaves, reasserted and strengthened the powers of the federal government, reset relations with the great European powers, and left an enduring legacy of bitterness and distrust that lingers even today. The portion of the Appalachian Trail most heavily impacted by the Civil War runs from the Shenandoah Valley in Northern Virginia, through West Virginia, into Maryland. Every year of the war saw activity along this part of the trail, a stretch that might be conveniently termed the AT’s “Civil War Corridor.” In April 1861, soon after Virginia’s secession, newly mustered Confederate militia units moved into the Shenandoah Valley to secure railroads, musket factories, and the all-important federal armory at Harpers Ferry. In July 1861, Confederate reinforcements traveled from the Shenandoah Valley to Manassas Junction via railroad to join the fighting at the First Battle of Bull Run (July 21), the first major military engagement of the war (also known as the First Battle of Manassas) and the first time in the history of warfare that troops were transported by railroad directly to a battlefield. The decisive Confederate victory at First Bull Run provided a sobering reality check for those who thought the conflict would be short-lived. Operations intensified in the valley the following year when Confederate Gen. Thomas “Stonewall” Jackson conducted what would become one of the most studied campaigns in military history. Jackson’s 17,000 men marched more than 600 miles and successfully engaged three different Union armies (52,000 men), demonstrating how a smaller force can defeat a larger force through rapid marches and the intelligent use of terrain. 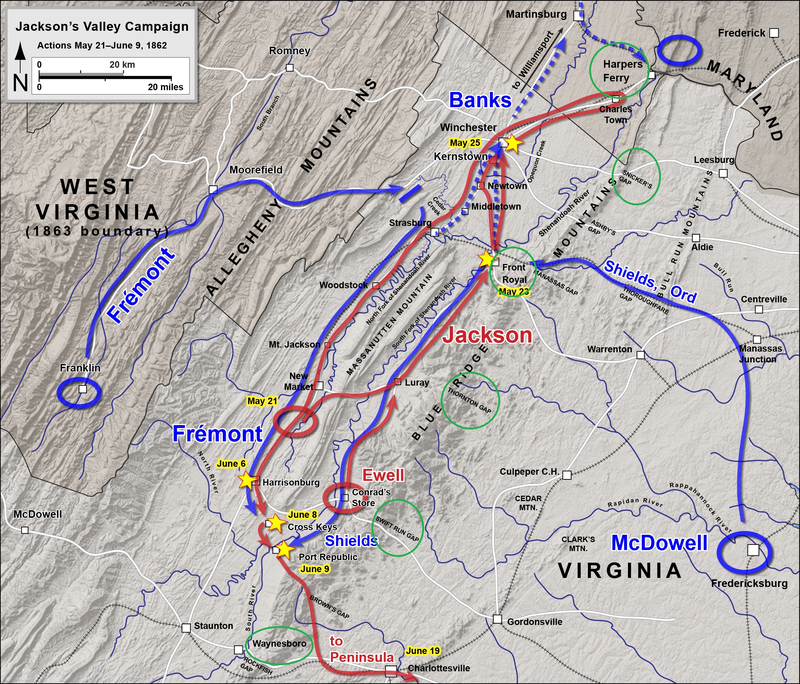 Jackson’s success in his Valley Campaign convinced officials in Washington that Confederate forces in the Shenandoah Valley posed a real threat to the Union capital and prompted the decision to withhold reinforcements from a Union effort to capture the Confederate capital at Richmond. The Union advance on Richmond subsequently failed, in no small measure due to Jackson’s success in the Valley. There were numerous important military engagements during Jackson’s Valley Campaign, which include the battles of Kernstown (March 23), McDowell (May 8), Winchester (May 25), Cross Keys (June 8), and Port Republic (June 9). For thru-hikers, the most accessible battle of the 1862 Valley Campaign is the Battle of Front Royal (May 23). Jackson’s decisive victory over a small Union force at Front Royal forced the main Union Army, under Maj. Gen. Nathaniel Banks, into an abrupt retreat and set the stage for Banks’s subsequent defeat at the battle of Winchester two days later. On the eve of the battle of Front Royal, Maria “Belle” Boyd, an 18-year old woman and one of the Confederacy’s most notorious spies, learned some last-minute information about Union troop dispositions in the town and ran through Union picket lines to relay this information to Jackson as he prepared his attack. It was a risky move. As Boyd later described, “the federal pickets… immediately fired upon me… my escape was most providential… rifle-balls flew thick and fast about me… so near my feet as to throw dust in my eyes… numerous bullets whistled by my ears, several actually pierced different parts of my clothing.” After capturing the town, Jackson sent Boyd a personal note acknowledging her contribution and her bravery. The Belle Boyd house in Front Royal, VA. Definitely worth a visit. Hiker tip: Front Royal is located approximately four miles west of the AT crossing at US 522. The town of Front Royal provides a shuttle/trolley service for hikers in the spring and summer and taxi service is also available. The Front Royal visitor center provides some excellent materials describing the battle and hikers can pick up a self-guided tour pamphlet covering some of the key historical sites. 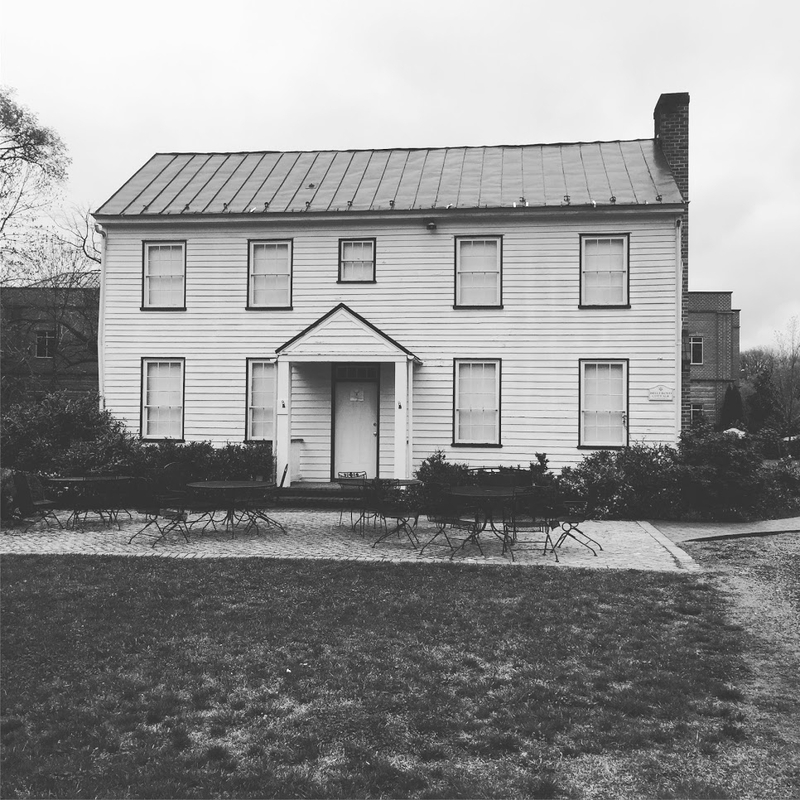 I also recommend visiting the Belle Boyd house for an excellent introduction to the life and adventures of this unique woman. The nearby Warren Rifles Confederate Museum contains a fascinating collection of artifacts, weapons, and other historical treatments from the period and is also worth a visit. Upon leaving Front Royal, NOBO AT hikers will pass through a history-rich region closely associated with the second major action of 1862: Confederate Gen. Robert E. Lee’s first attempt to invade the North. Lee believed that the Confederacy’s best chance for victory lay in winning a decisive victory on northern soil that would erode northern morale, weaken their will to fight, and perhaps even impact the approaching northern elections in a way favorable to the Confederacy. 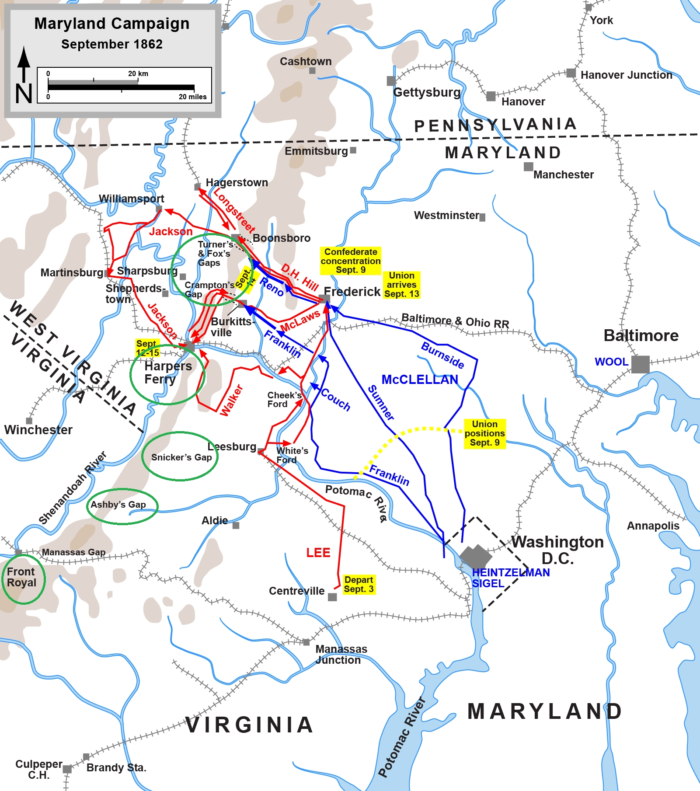 In early September 1862, Lee’s Army of Northern Virginia crossed into Maryland with the intention of marching into Pennsylvania and engaging the Union army on terrain of Lee’s choosing. A Union force of 13,000 men stationed in Harpers Ferry threatened the Army of Northern Virginia’s lines of communication, however, prompting Lee to make the risky decision to divide his army and send the reliable Jackson to deal with the nettlesome garrison. Harpers Ferry fell on Sept. 15, but not before advance elements of the Union’s Army of the Potomac had inflicted a serious defeat on Confederate forces at the Battle of South Mountain (Sept. 14). Following this setback, Lee regrouped, concentrated his army, and took up a defensive position along Antietam Creek. On Sept. 17, the Army of the Potomac, commanded by Gen. George B. McClellan, attacked. The ensuing battle raged all day and resulted in a combined total of approximately 23,000 casualties, making the Battle of Antietam the single bloodiest day in American military history. Tactically, the battle was a draw as both armies remained on the field. Strategically, the battle was an important Union victory. The fighting had cost the Army of Northern Virginia dearly and Lee realized he needed to move his tired and bloodied army back across the Potomac. On the night of the 18th, Lee ordered a retreat. Lee’s attempted invasion of the North ended in disappointment and the war dragged on. 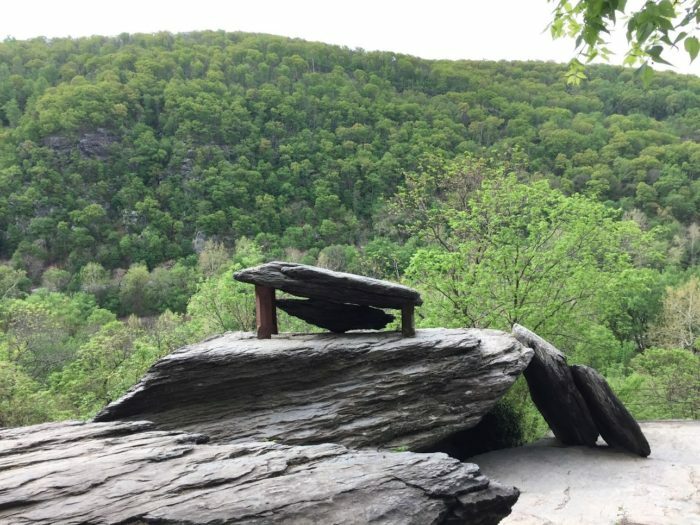 For thru-hikers, the most notable features of the AT associated with Lee’s Maryland campaign are Harpers Ferry and the section of the trail in Maryland that traverses South Mountain. Hikers approach Harpers Ferry, the spiritual halfway point of the AT, along Loudoun Heights, where the discerning eye can spy the remnants of entrenchments occupied by the Confederates during the battle for the town. The white blazes then guide hikers straight through the history-drenched town, passing by Jefferson Rock (providing a spectacular view of the junction of the Shenandoah and Potomac rivers that, according to founding father Thomas Jefferson, was “worth a voyage across the Atlantic”), John Brown’s fort (where the troubled abolitionist was captured in 1859 after his failed effort to start a slave insurrection), and many other sites of historical interest. After Harpers Ferry, the trail crosses the Potomac River and enters Maryland, traveling 41 miles along the ridge of South Mountain and traversing several gaps that saw sharp fighting during the battle (e.g., Crampton’s Gap, Fox’s Gap). At Turner’s Gap, the AT passes right by the Old South Mountain Inn, a building that likely served as a staging area for John Brown’s raid on Harpers Ferry and subsequently served as the headquarters for Confederate Maj. Gen. D.H. Hill during the Battle of South Mountain. Hiker tip: Although Harpers Ferry is perhaps most famous for its association with the Civil War, I recommend hikers take the time to explore the many other fascinating aspects of the town’s history. This includes its important role in the preparations for Lewis and Clark’s Corps of Discovery Expedition (1804-1806) and in the railroad vs. canal competition of the early 19th century. I also recommend hikers take advantage of the copious historical signage placed at various points along South Mountain and its environs. Take a snack or water break and read the signs—well worth the time and effort. 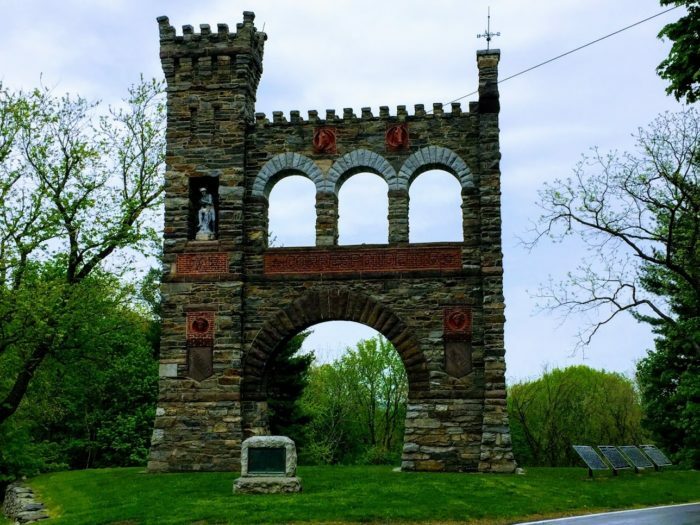 The War Correspondents Memorial Arch in Gathland State Park, Crampton’s Gap. Built in 1896, it is inscribed with the names of 157 correspondents and war artists that served during the Civil War. While the two campaigns of 1862 represent the most significant military operations along the AT’s Civil War Corridor, one should not forget that there were also movements and maneuvers associated with Lee’s 1863 invasion of the North culminating in the three-day Battle of Gettysburg. There was also significant fighting in 1864 when Union Gen. Ulysses S. Grant sent Gen. Philip H. Sheridan to clear the Shenandoah Valley once and for all to deprive the Confederate armies of the food and forage the Valley provided (Sheridan’s orders were “to devastate the whole area so thoroughly that a crow flying across the Valley would have to carry its own rations.”). Seeing as this post has already expanded beyond a reasonable length, however, I think it best to treat the actions of 1863 and 1864 in a future post. When passing through this region, I hope that hikers will remember that these woods and mountains once echoed with the sounds of soldiers on the march, cursing as they toiled along dusty roads bearing heavy packs and sweltering in the unforgiving summer heat (something that will be familiar to most hikers), and that these mountains, passes, and towns once bore witness to desperate and bloody fighting that played a key role in determining the future of the United States. Hiking the Civil War Corridor on the Appalachian Trail is hiking with history in a very real sense and it is an exciting, educational, and sobering experience. I just finished sectioning the exact area that is covered in this article. I started about 50 miles South of Front Royal and went North into PA. Not only is there lots of war history. It’s also great to stop for the AT Museum and get a look at the crazy gear of our hiking heroes. Compared to other parts of the trail, it’s relatively easy going, with a lot of beautiful rural countryside and forest areas. The historical stuff was excellent to stop and ponder. When you are walking you feel a special kinship with the humble footshoulder that also walked here. A wonderfully illuminating article HH, thank you for so much detail, detail that perhaps only a very few history buffs will wade through. I do take exception with the last sentence of the second paragraph:…” It was a conflict that freed the slaves, reasserted and strengthened the powers of the federal government, reset relations with the great European powers, and left a legacy of bitterness and distrust that would take generations to overcome.” I would argue that we don’t yet know if generations or indeed centuries will be required to get over the legacy of the defeat of the Confederacy and the reaffirmed supremacy of the Union. Because of course, that legacy still rears it’s ugly head in the partisan and divisive politics and closed minded social norms of the Radical Conservative movement (the rightful progeny of the Confederacy). Thank you for reading and commenting! You are the third person to point out that the last sentence of the second paragraph is probably too optimistic in suggesting these divisions / issues are now safely in the past. I think the criticism is on target and am going to think about ways to tweak that and make it a bit more nuanced. And I sure hope that more than just history buffs read/wade through my stuff – because I hope to create *new* history buffs in the hiking community!